Since I rediscovered Abercrombie a few months ago, I’ve become completely obsessed with their clothing. When I was dating my husband, I bought my first pair of Abercrombie jeans, and here we are ten years later coming full circle. Who would have thought? I’m just super impressed with their rebrand to be age appropriate and a little more mature. I bought this pair a few months ago and have been wearing them to death, and then I found this distressed pair and now have been wearing them nonstop. Also I’ve been itching for fall lately, and instantly fell in love with this dark floral top. 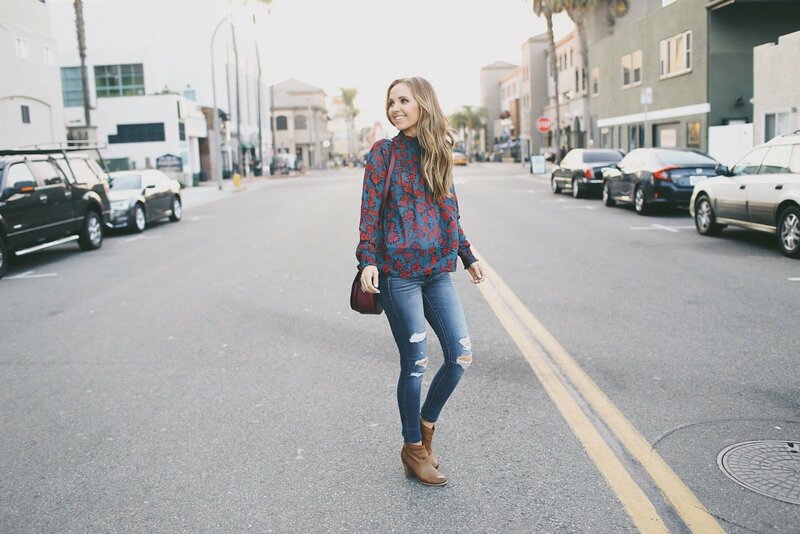 It’s an easy top to throw on with jeans and ankle boots, but it makes a statement and really makes the outfit. Plus it’s lightweight so it’s a good piece to wear when transitioning to fall, and it comes in a ton of other colors! 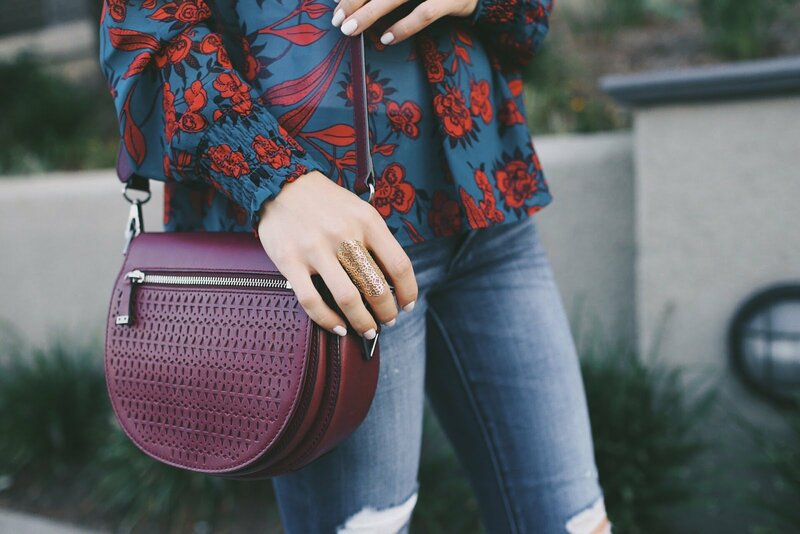 Beautiful blouse and perfect bag! This is a great outfit for Autumn! 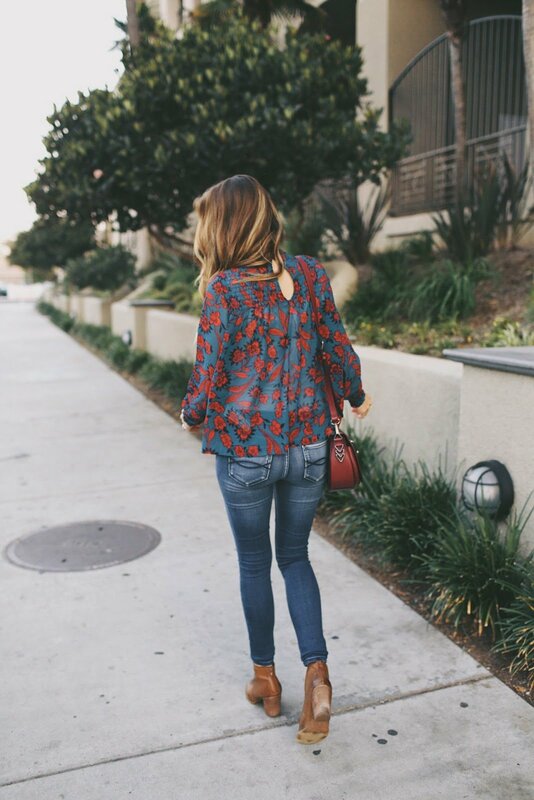 I love this blouse, perfect for fall! These jeans look awesome on you! Great picks! And the top gets me so excited for Fall! I can’t believe this top is from Abercrombie! It’s so pretty. Love this look for fall. I love everything about this outfit. The saddle bag is classic. The colors are perfect for fall. The booties are great. Love it.